"This pie is delicious, with or without a filling. 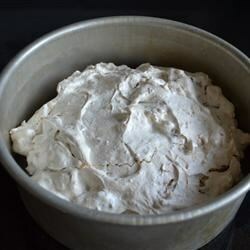 I make it with pecans and serve it with whipped topping and one shake of nutmeg on top. Or I make it without pecans and fill with fruit filling such as lemon filling. I use soda crackers, saltines, graham crackers or buttery round crackers, finely crushed"
In a medium bowl, beat egg whites until stiff. Fold in sugar, baking powder, crackers, vanilla and pecans. Spoon mixture into a greased 9 inch pie pan. Bake for 25 to 30 minutes in the preheated oven. Cool and serve or fill with the fresh fruit of your choice. Wonderful homey dessert. I have also made this using blueberry or cherry pie filling as a filling. Try this, even if it sounds strange. You will be amazed. I baked a little on my silpat sheet alongside the pie, filled it with almond whipped cream, then crumbled the extra on top. So delicious! Good, but I thought it was too sweet.